LGBTQ = Lesbian, Gay, Bisexual, Transexual, or Queer. 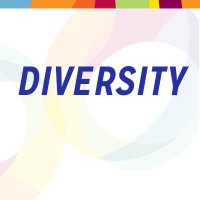 Gender is complex; while many people identify as either “man” or “woman”, others identify as something other than traditional binary gender options (i.e. “non-binary” gender). CERP data indicate non-binary students report lower levels of peer support compared to their men and women peers. 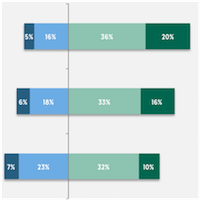 CERP surveyed 101 undergraduate students majoring in a computing field who indicated that they had seriously considered changing to a non-computing major. Of those students, 7% identified as LGBTQ women, 7% identified as LGBTQ men, 27% identified as heterosexual women, and 59% identified as heterosexual men. When asked to indicate the reason they thought about changing their major. 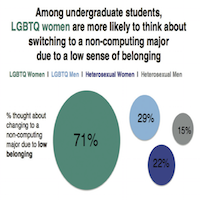 LGBTQ women were significantly more likely than their male LGBTQ and heterosexual peers to have considered leaving their major due to a low sense of belonging in computing, p < .05. These findings suggest the field of computing should take significant efforts to enhance LGBTQ women’s sense of belonging in computing.